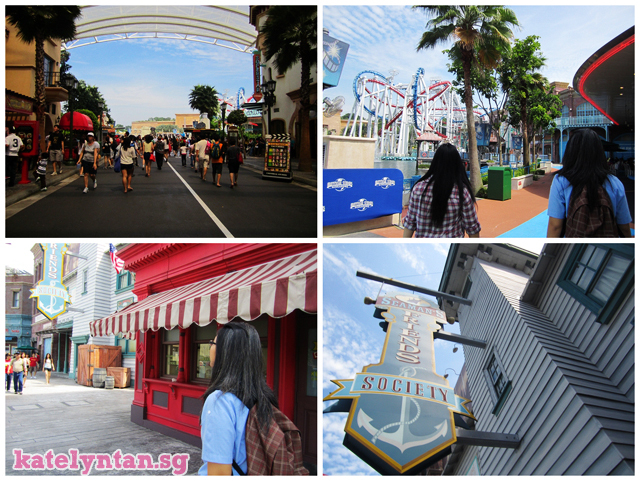 A Day at USS with le Sisters - Universal Studios Student Season Pass! The 3 of us got the Student Annual Pass! They call it the annual/season pass. Not really a real annual pass though. 6 Months unlimited entry for students now only at $88*! For a limited time only, present your student pass and purchase a Universal Studios Singapore Student Season Pass for only $88. This gives you 6 months unlimited access to your favourite rides and shows, as well as exclusive dining and shopping offers, from now till the end of November. *Terms & Conditions apply. Valid for purchase until 30 June 2013 for Students aged 13 years & up. Season Pass usage and benefits valid till 30 November 2013 only. 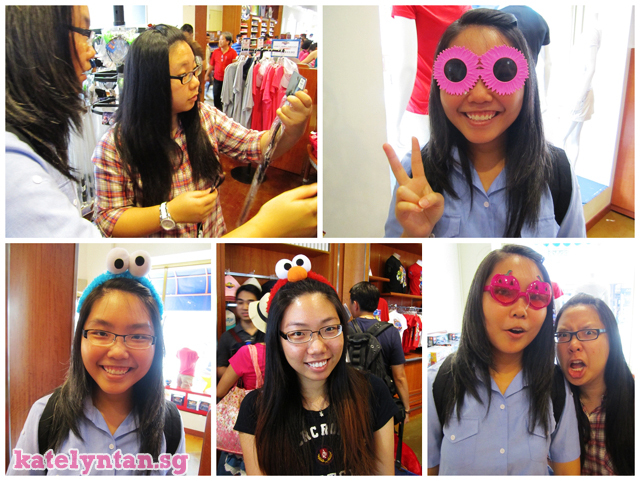 First thing that attract le sisters was the gift shop lols. Cylon! Was looking forward to all the rides that day! Really needed some roller coasters to help de-stress! Anyways. Sorry for all the bare face photos. Didn't put a single bit of makeup that day, not even my brows or lips. 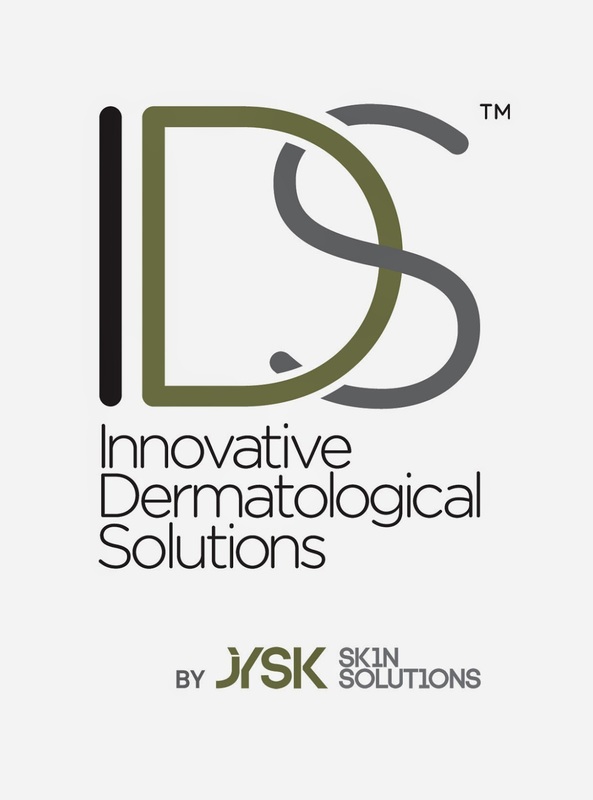 Only applied my DRx toner, Max-C, and sunscreen. On the left is a photo with huibin a.k.a kate. On the right is a photo with huiling a.k.a kayley. Facebook happily recognized all our faces and tag as me! Do we really look that alike? Our faces after taking Battlestar Galactica Human and Cylon consecutively. 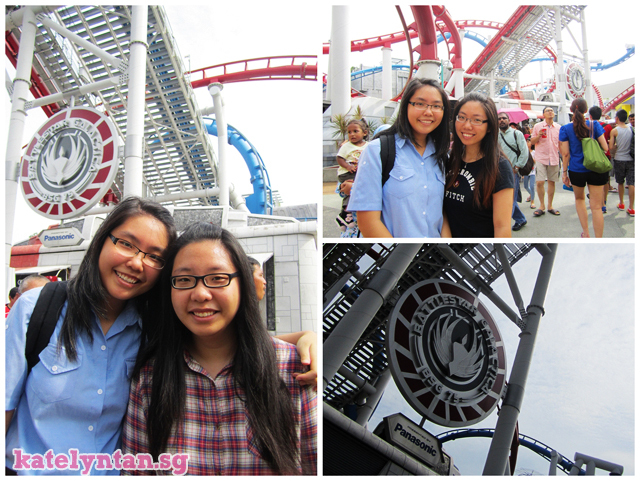 The queue for cylon was crazy in the afternoon! 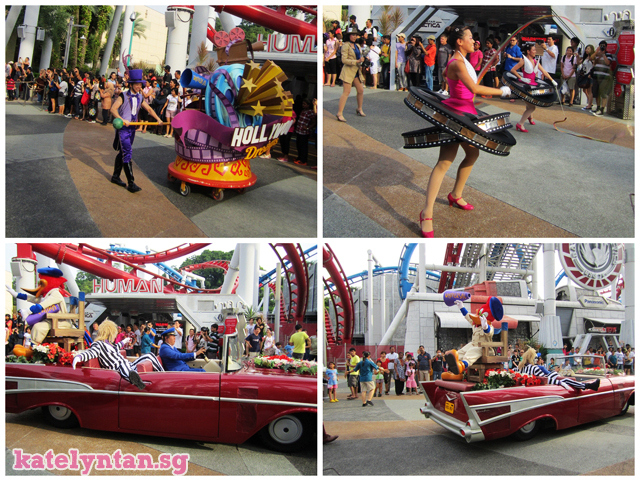 Anyways after the parade (5.30pm) they stated that queues for human and cylon were only 5mins long. The mad expensive bottle! But huibin wanted that so... she had to pay for it herself! I paid for their tickets already okay! 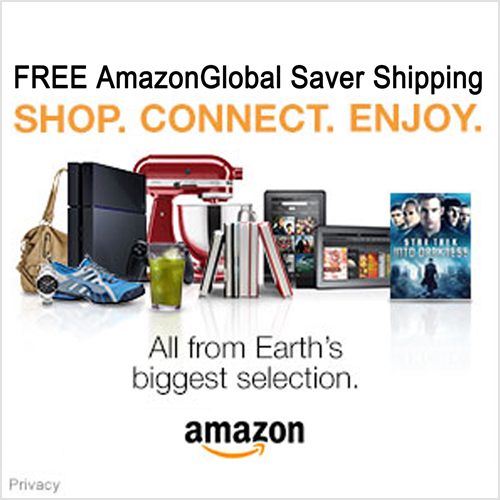 $264 gone in one swipe! Daddy sponsored $100 though hahas. After drinking up, it was time for the mummies ride! It's her first time taking roller coaster rides. 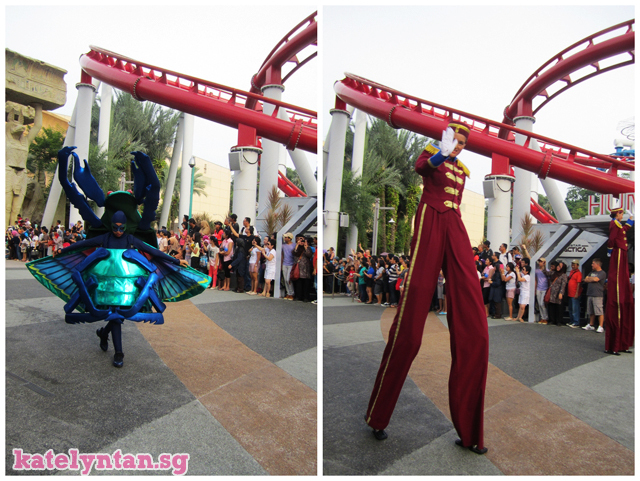 The first time I came to USS, Human+Cylon was enough to make me queasy. I was so scared then. But now it's like mehh. Hahas. 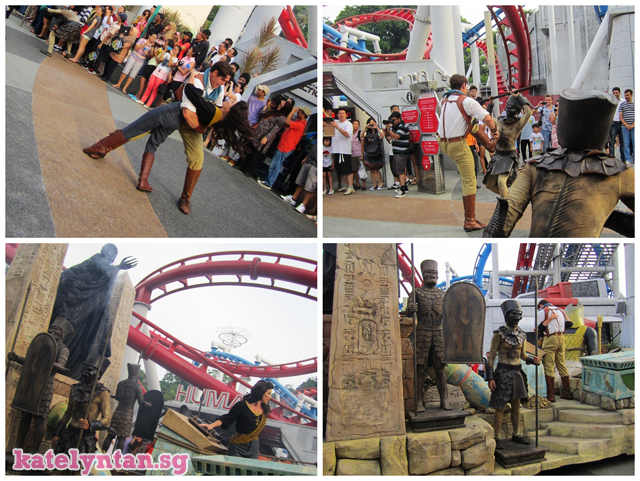 Anyways, back to the mummies ride. BOTH MY PHOTOS WERE NICE! Both photos I was looking at the camera, smiling with the cheese sign. 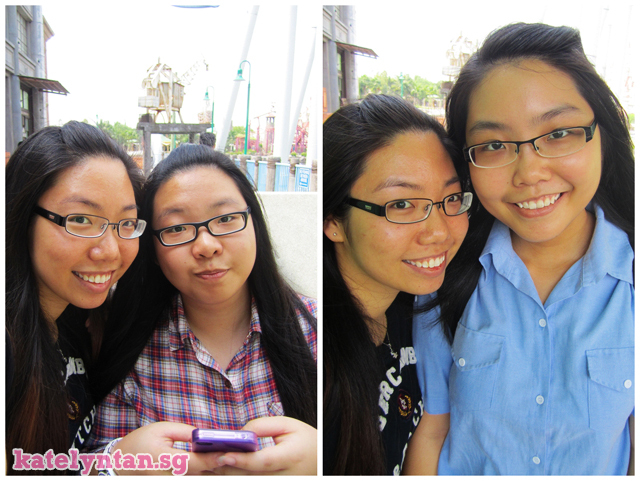 Huibin looked okay in both photos but she couldn't really catch the camera angle well. 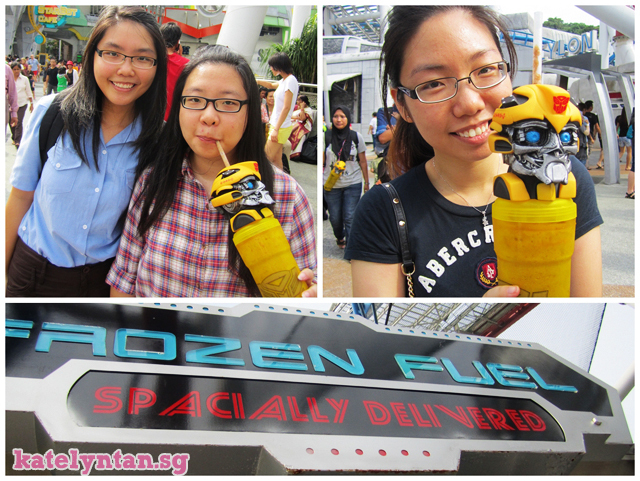 Huiling closed her eyes for the first photo, for the second photo she was holding on to the handle lols. Btw, if you want to take nice photos, sit on the 3rd or 4th row. 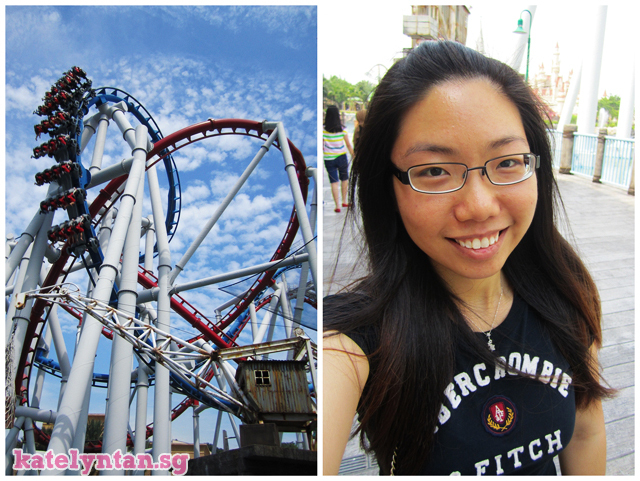 And the camera is on the right :) I've taken this ride 5 times in Singapore lols. Hungry peeps need some food! We had corn dog and sat down to wait for the parade. Huibin says it's all thanks to me. Cause when she asked me to guess how much was it, I said $4. And I was so pissed when all these people cut infront of us! Especially a group of women/aunties who appeared out of nowhere! They came from behind and stood infront of my sisters and I.
they tried to squeeze between my sisters and I just so they could stand in the first row! Couldn't really take decent photos all thanks to those women/aunties. Here I felt better, was less angry and became really happy. so they squeeze in to stand beside me instead. Then here came the penguins. PENGUINS I LOVE YOU! Cause... look at the last photo. The penguin squirted water at them hahahas! I saw the penguins squirt water before they reached my sis. I went "Ah!" and it stopped right before it reached us. Lols. Then I laughed a lil when they squirted those aunties before me. 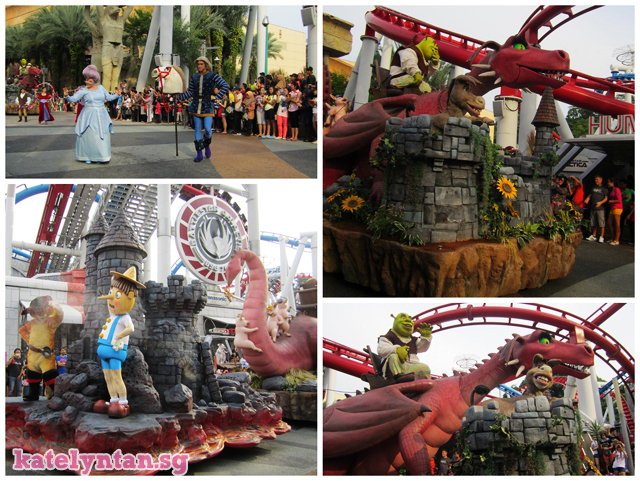 More photos from the parade. 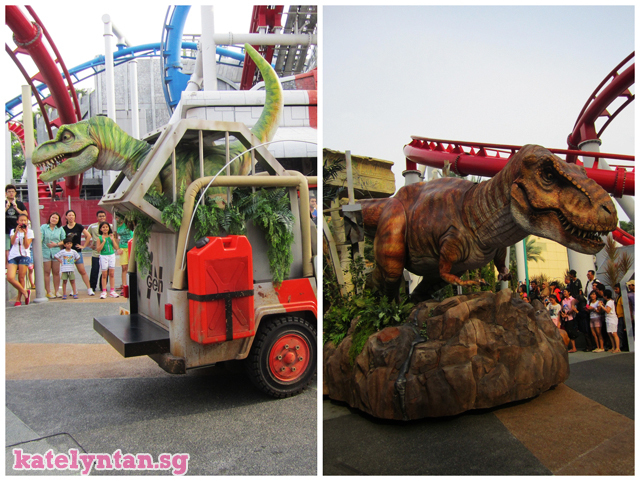 Here I think there were small dinos behind the trex and they squirt water too! I think they squirted at those aunties again lols! 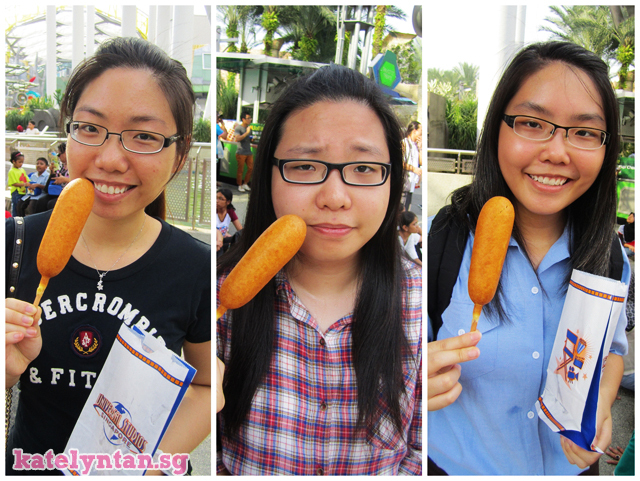 Remember they were squirted twice but I can't rmb what was the second one that squirted at them. they squirt at people who stand infront of the white line! Those guys are scary! They will purposely come close to you and give you a fierce face! One of them spot a girl behind a bulletin board and went up to her to scare that. That girl really screamed. So poor thing. 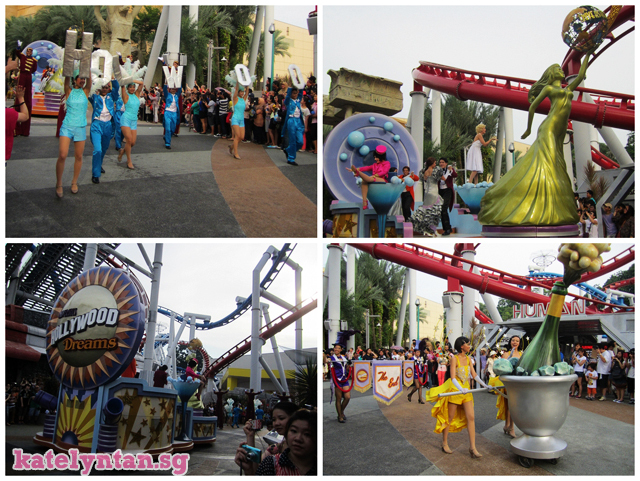 That's all for the parade! After the parade we decided to go and walk around and not take anymore rides. Cause huiling was still feeling a lil queasy. 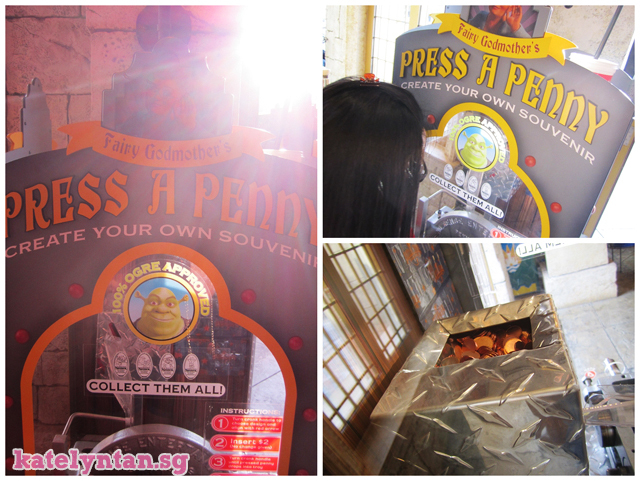 Brought them to the potion shop and we saw the penny machine! My favorite in the states! When I was in the states, when ever I saw one, I would make one. And I will purposely keep shiny pennies for it. Here they use fake pennies though. And they are a freaking $2 each! If it is $1, I don't mind collecting. But $2, that's crazy! It's only 51cents in the states. Sis finds that puss in boots v cute. All rides that we took, we always sat on the first row! 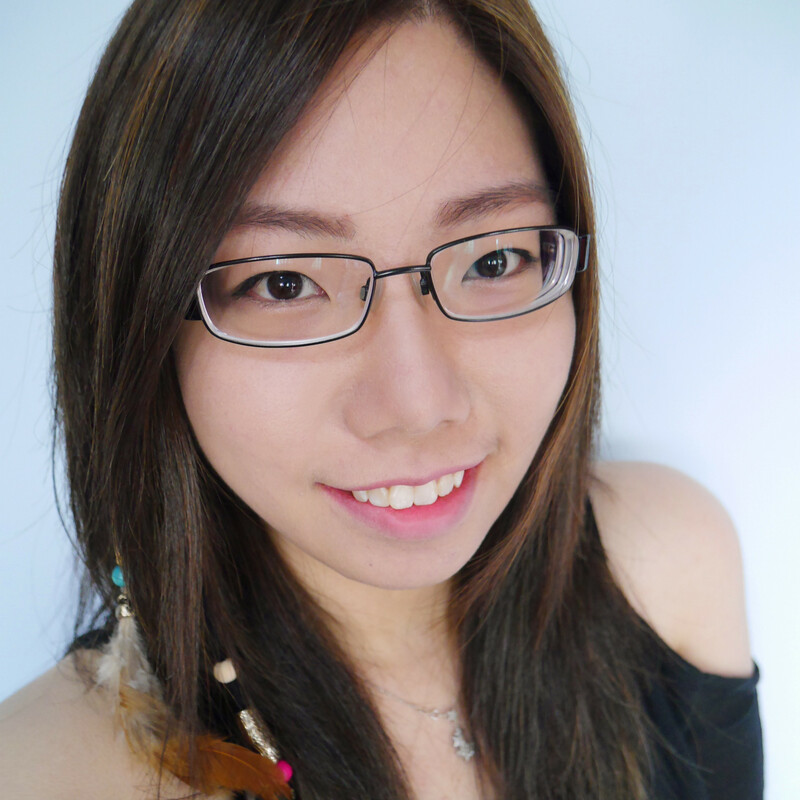 Huiling had two daring sisters who isn't afraid of roller coasters anymore. Hello Rockefeller! I would love to go back to NY to visit you! The first time I came to USS, I have no idea what this building was. Random streets which I've never been to. 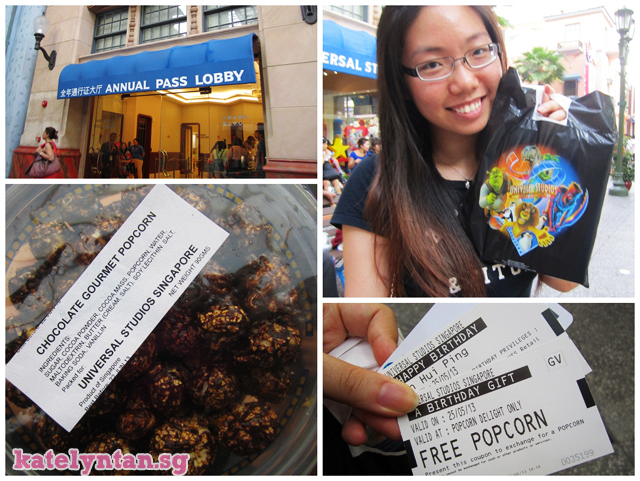 Then we went to get our annual pass. 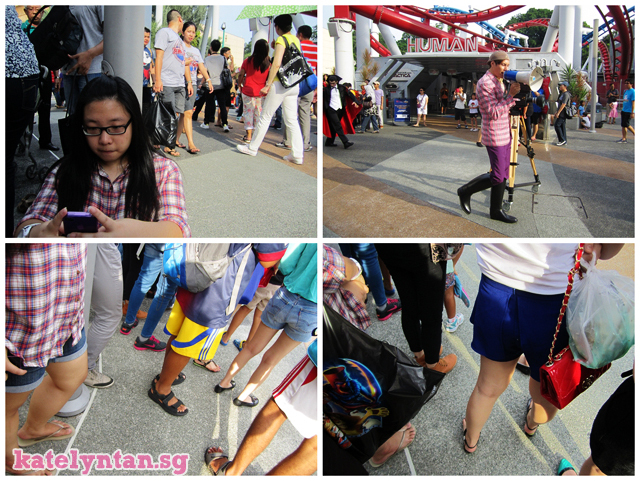 The queue in the morning was mad long. So the lady there told us to go and take rides first then come back when we are leaving. Do take note that you will have to take a photo for the pass. So... I will highly recommend that, no matter what, just queue in the morning! All these cute things always attract me to them. See all those people in the background? That is the queue for the monorail! We decided to take a bus out. There was a long queue too. But the queue moves rather quickly. Then... here comes the traffic jam! Anyways that's all for these post! Next, I want to go to the S.E.A. Aquarium! Anyone want to go with me? Hahas. 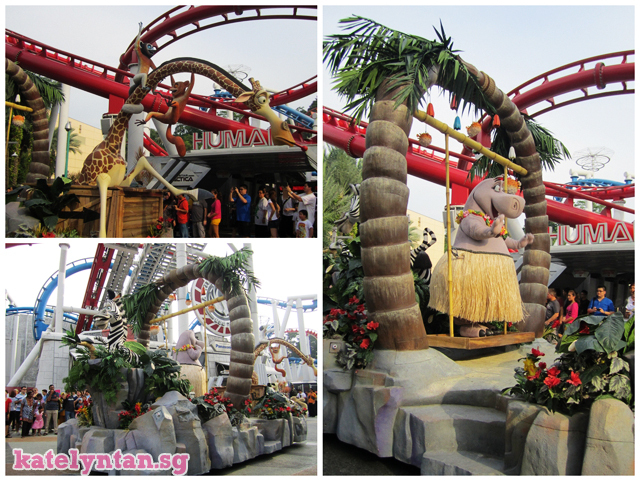 I haven't been to many places in Singapore :( I want to go to River Safari and Gardens by the Bay too! Hmmm and there's Snow City (I've never been there before though it's been here for years). Bottle Tree Park seems not bad a place too. Maybe I should act tourist for a couple of days and go to all these places lols. It's so worth it hahas. Just need to go there twice and it is worth the price already. Should try out the S.E.A. 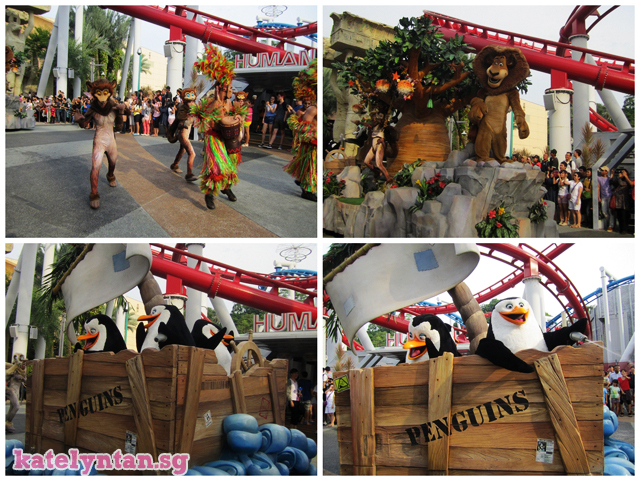 Aquarium and Adventure Cove Waterpark located just beside Universal Studios Singapore.